Just a quick update to the site. 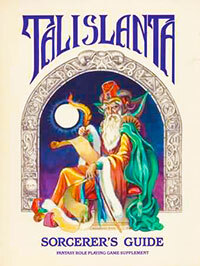 Sorcerer’s Guide has been added to both the Talislanta Library and The Scanning Project pages. Be sure to give the arduous scanner, Howard A. Jones, a special thank you for bringing this long standing fan favorite into your grubby little hands. Howard you have my personal thanks! THANK YOU! The Sorcerer’s Guide is an invaluable aid to the aspiring Magician. Within the pages of this book are contained the secrets of Talislantan magic, including: The Lyceum Arcanum, a listing of rare spells and incantations, and over a hundred different types of enchanged items, weapons, artifacts, charms, and fetishes. A listing of magical tomes and reference works, Tamerlin’s Guide to Extra-Dimensional Entities, Lists of Magical Correspondences, a dozen new character types, The Ariane Maze – City of Altan, and Cabal Magicus; a fabulous floating settlement, home to the Phantasians. This entry was posted in Scanning Project News, Website News - New File Added. Bookmark the permalink. Both comments and trackbacks are currently closed. Does Tal.com Need An Extended Miniatures Directory? By the power of all that is cast and the immortal gods of pewter, YES!!! Miniatures are mere toys for those lacking imagination and true vision, NEA I SAY!! !